…. I turned in the manuscript to my second cookbook today! #inspiralizeeverything, coming soon. And you’d think I’d feel relieved, but I’ve been putting off SO many things the past few days in order to finish in time, that I’m swamped! Sorry for the late and short post, but I just couldn’t leave a day without a new recipe for you all! And now, it’s 2016 and we have our first parsnip noodle recipe – which, if you haven’t had them yet, parsnip noodles are nutty, woody and so lovely that you don’t need much of a sauce- their flavors speak for themselves. This recipe is simple, quick and easy – and comes together in minutes! And although I have a busy week ahead, you can bet your bottom dollar that I’ll be rejoicing/face-planting in a big goblet of wine when everything is done… around Friday at 5pm. Who’s with me? Let’s DO this week! Preheat the oven to 400 degrees, line a baking sheet with parchment paper and lay out the butternut squash. Drizzle with 2 teaspoons of the oil and season with salt, pepper and paprika. Toss to combine and once oven is preheated, roast for 30-35 minutes or until fork tender. Ten minutes before the squash is done, place a large skillet over medium-high heat and add in the rest of the olive oil. Add in the parsnip noodles and let cook for 5-7 minutes or until cooked through. 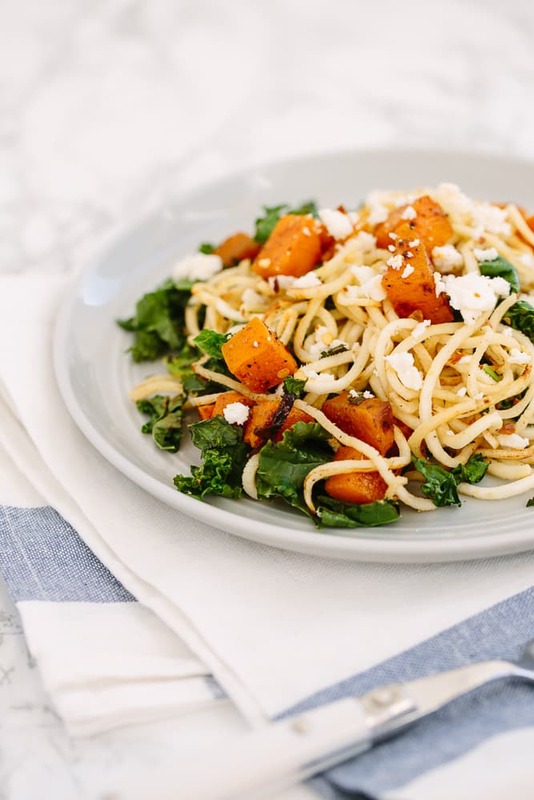 Transfer the parsnip noodles to a plate and add in the kale and garlic. Let cook until wilted, about 5 minutes and then add back in the parsnip noodles. Toss to combine and then divide onto two plates and top with butternut squash, feta and the red pepper flakes. This is so awesome, so proud of you!! Can't wait to snag a copy! And good luck girl, you've got this! I'm curious why this is so many smart points. When I add it up it comes closer to 8 per serving. The parsnips, olive oil and feta is all that I counted. Are your parsnips huge? I will make it, but attempt to lower the SP with less EVOO and reduced fat feta. Two questions: Where should the blade letter show, too? What's the best way for a lefty to use the spiralizer? Hi Ali, This sounds delicious! 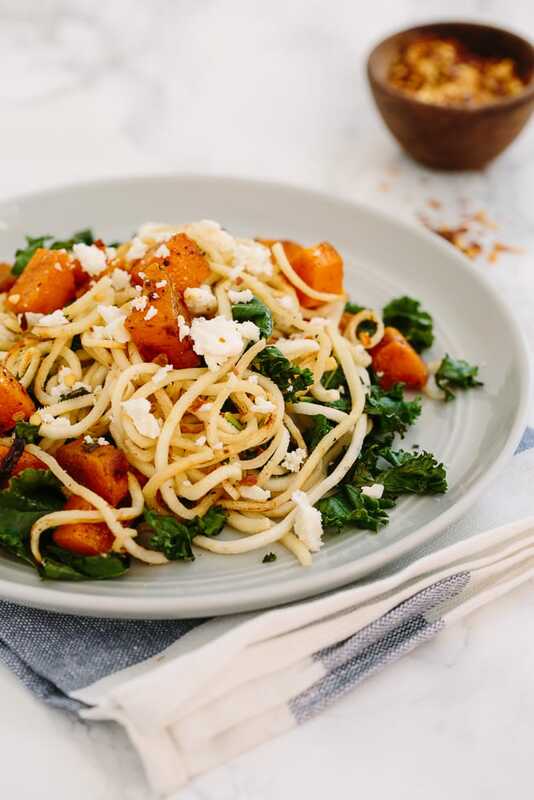 I would just suggest a slight rewrite in step 2 you have written: Transfer the parsnip noodles to a plate and add in the kale and garlic. 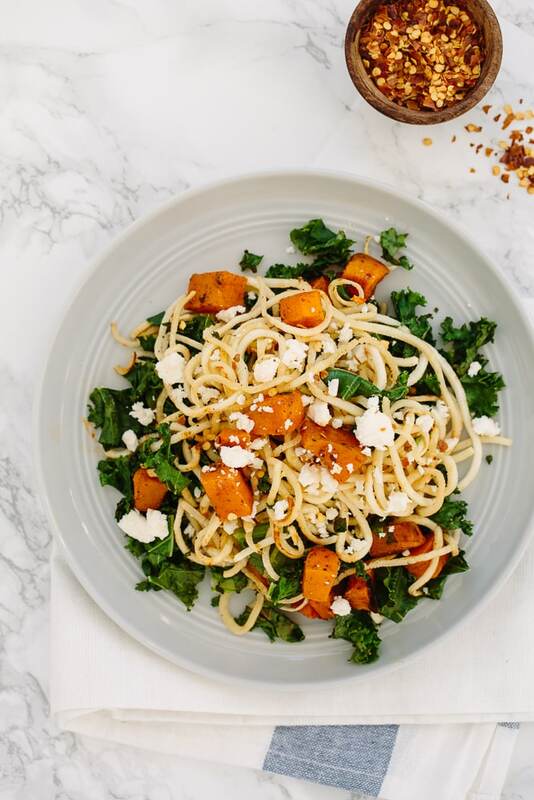 It took me a few reads to understand that the kale and garlic go in the pan and not onto the plate (I was a little puzzled how the plate was gonna wilt the kale). Just a little suggestion. Can't wait to try it! Oh yowza! Does that look divine or what? I could even see some goat cheese in place of the feta -- although I love feta! I could also see some grilled flank steak along side, or even some chicken! Looking forward to your new cookbook! Enjoy that wine on Friday -- I think I will be having some brandy in hot tea with all the snow out west! Congratulations on your second cook book! Very proud of you! I ordered your inspiralizer and I own your first book. Can't wait to order the second book! Thank you fir sharing such awesome, delicious and healthy recipes.